Guided inshore fishing trips on Mobile Bay will not happen without a boat. Gulf Shores fishing charter boats require proper motor set up. To provide fishing opportunities to anglers of all types. Mobile Bay is 413 Sq miles and averages 10' deep. This requires a boat that does handle a chop. USCG licensed Captain Patric Garmeson runs the Ugly Fishing Blue Wave 2400 Pure Bay. This rugged hull is powered by a 250HP Yamaha SHO. . The boat is equipped with a Raymarine Axiom gps/fish finder. The Raymarine is used to locate fish and maintain course while navigating Mobile Bay, Gulf Shores, Fort Morgan and Dauphin Island. Lenco trim tabs on the transom of the boat will provide a smoother boat ride. Even in the choppiest of conditions in Alabama inshore fishing waters. 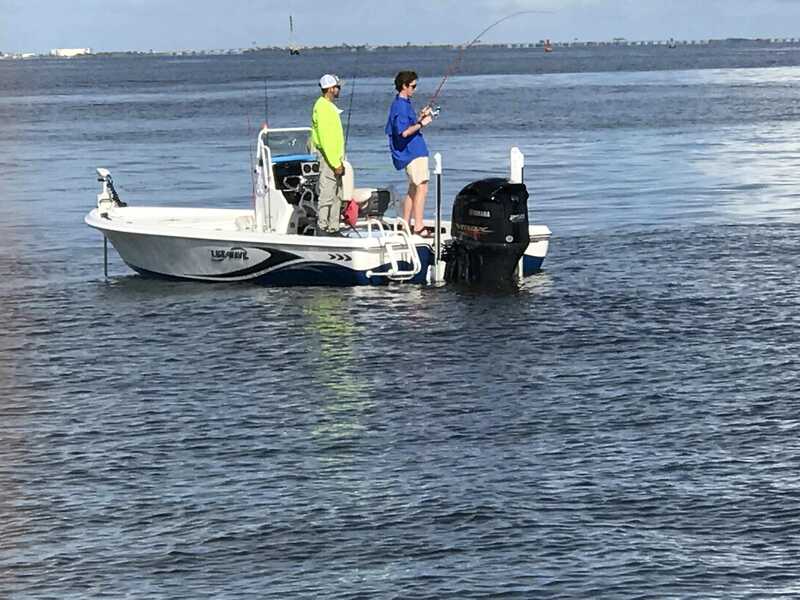 Mobile Bay averages 10' deep with many areas less than 3' deep and allows Ugly Fishing LLC Captain, Patric Garmeson, to utilize twin Power Pole power anchors. The power anchors provides better inshore fishing Daphne, Fairhope, and Point Clear areas. The last vital piece of fishing equipment on Ugly Fishing Blue Wave Pure Bay is the remote control/GPS tolling motor. Ugly Fishing inshore fishing charters has the Motor Guide Xi5 pinPoint trolling motor. This trolling motor has the capabilities to maintain full control of the boat in some extreme conditions. This allows for USCG licensed Captain Patric Garmeson to tend to those on the boat and not have to fight with an anchor or hand control trolling motor. Gulf Shores fishing charter boat Ugly Fishing is well laid out to provide clients with plenty of storage, walking around room and cooler space to accommodate items brought along. One of the most important features of the vessel are the large live wells system that allow to carry plenty of live bait when live bait is being used for fishing near piers, reefs, and grass beds of Mobile Bay.